The Gallery Restaurant in this 15th century Grade II listed building is an elegant yet intimate location for luncheon, dinner and special occasions. The restaurant makes a magnificent setting with timbered ceiling, inglenook fireplace and minstrels’ gallery. The food is painstakingly prepared by the resident chef using fresh ingredients which are delivered daily. The Gallery has earned itself a deserved reputation for fine food and wines. The Gallery Restaurant makes a magnificent seting for your meal, with timbered ceiling, perpendicular style window, inglenook fireplace and minstrel's gallery. 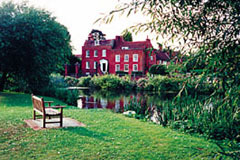 popular as a venue for wedding receptions, special birthdays and anniversary parties. The Cedar House enjoys an unprecedented reputation for providing memorable enjoyment. The Cedar House Hotel bedrooms are all en-suite, tastefully decorated, with TV, tea and coffee making facilities and IDD telephones. Open for lunch 12-2.30pm and dinner from 7pm (closed Sun evening). All major credit cards accepted (not Amex/Diners). No service charge (except parties 12+). New English style cuisine using fresh ingredients delivered daily. Our a la carte menu includes such favourites as Cannon of Lamb with Shrewsbury Sauce, Medallions of Monkfish and Venison with Redcurrant Jelly Gravy. Traditional French dishes include Grilled Magret of Duck with Cherry Sauce and Coq au Vin en Cocotte.